Yulia Malinina and Pavel Otdelnov – the young but already well-known artists – share not only loyalty to the seemingly quite traditional figurative art, but also themes they choose for their works. Both Yulia Malinina and Pavel Otdelnov paint architectural landscapes free of any sign of human presence. 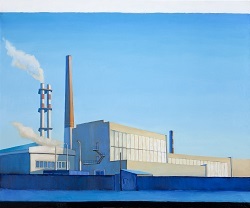 Yulia Malinina’s compositions feature industrial architecture – plants and factories. Her artwork evokes the industrial architecture sites in the pictures of conceptual photographers Bernd and Hilla Becher, who since the 1960s mostly photographed abandoned landmarks of the past industrial era, which did not leave in its wake palaces, cathedrals or other, more customary landmarks. Yulia Malinina’s figurative art looks like a reincarnation of the artistic idiom of the 20th-century modernism, including the American realism of Edward Hopper or Charles Sheeler and the metaphysical landscapes of Giorgio de Chirico. Pavel Otdelnov, whose artistic vocabulary is likewise located at the junction of photographic and painterly aesthetic dimensions (by his own admission, he has been influenced by the modern photographer Andreas Gursky, as well as the Russian pop artist and painter Mikhail Roginsky), also explores the architecture of the sites set to become monuments of the next, post-industrial era which will not leave in its wake palaces and cathedrals. His paintings feature not industrial landmarks, but landmarks of consumption and communication: Pavel Otdelnov images trading centers on the outskirts, fuel stations and highways. However, the beauty found by the artist in these facilities, which only recently began to dot our living space, is far from the pop-art ironic apologia of the flashy ephemerality of the current moment. His compositions are as deserted as Yulia Malinina’s industrial landscapes and likewise appear to be not so much signs of the present as landmarks of a bygone era. Factories without workers, trading centers without shoppers, roads without cars look like present-day ruins – but also like nobody’s lands open for exploration, conquest, settlement. The factories deserted after the end of an industrial era have recently been re-designated – former industrial facilities and power plants, as is well known, host the museums of modern art and art clusters. It is quite possible that by the end of our century a similar fate will await deserted trading centers whose gaudy architectural design will acquire by then a nostalgic charm.